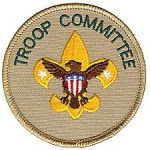 The Boy Scout Troop Committee is responsible for conducting the business of the troop, setting policy, and helping the Scoutmaster and Scouts with the outdoor program and other planned activities. The committee also has the responsibility to provide adults for boards of review. This is an important responsibility and is one area where help is always needed and appreciated. The committee consists of parent volunteers who fulfill various roles on the committee. Troop 12's committee meets monthly, usually on the last Wednesday of the month. Please see the calendar for meeting dates and times. To join the Troop Committee, please contact the Committee Chair.